There are certainly some downsides to working aboard a massive container ship that criss-crosses the world’s oceans for months at a time. 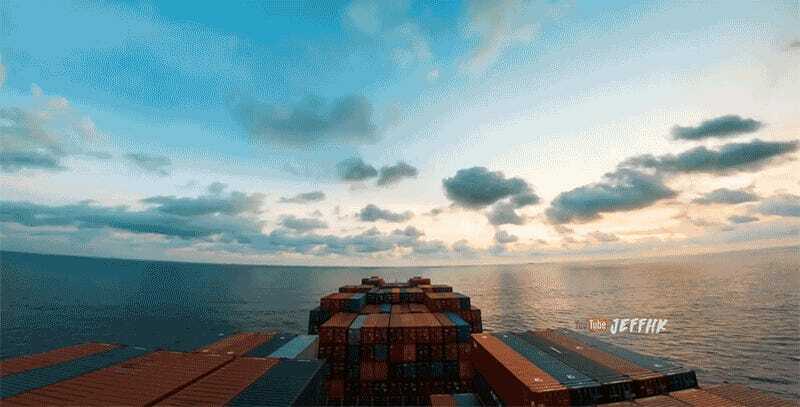 But through the lens of JeffHK’s timelapse camera, it’s hard to imagine a more soothing and relaxing career choice than roaming the open sea. Over 30 days, Jeff captured roughly 80,000 photos of the ship’s journey through the Red Sea, the Gulf of Aden, the Indian Ocean, and the South East China Sea, and countless ports where cargo containers were hurriedly offloaded and restocked. That equates to roughly 1.5 terabytes of footage that were condensed into this astounding ten-minute, 4K timelapse that will make you long for a life at sea.